Michael Collins Ajereh was born in Umuahia and hail from Delta state. His family moved to Ajegunle city in Lagos state where he was raised, and graduated from Federal Government College Lagos. Michael Had always had a flair for music singing and playing the drums from the age of four. He developed a passion for the bass guitar at the age of 12, he went on study Business Management at the Ambrose Alli University Ekpoma in Edo state. He moved to London in the United Kingdom in 2000 after his Uncle invited him to come play the drums for the neighbourhood Church. Various odd jobs followed including working at McDonalds and as a security guard. Already imbued with an intimate knowledge of traditional and percussion instruments, Don Jazzy further built on his musical knowledge during his UK stint. Finding fellow kindred sprits in the likes of Solek, JJC, Kas, The 419 squad and D’Banj, the gang would spend unrelenting hours practising, recording and performing different types of music. His appetite for a full-time career in music could no longer be satiated when, in 2004, he partnered with D’Banj to set up the Mo’ Hits label. Within two years, the prolific producer had wrapped up two albums (No Long Thing and Rundown/Funk You Up) with his former Mo’ Hits partner and was working on a third, Curriculum Vitae. 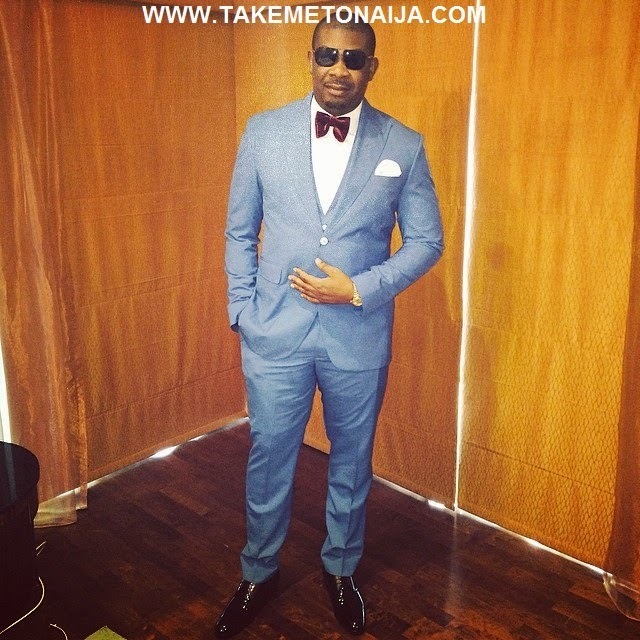 By this time, he had already started becoming a household name with the trademark intro – It’s Don Jazzy Again! In 2008 there were further production credits for the best selling album of that year, The Entertainer Don Jazzy repeated the trick with Wande Coal’s Mushin 2 MoHits, an album that was described as one of the best albums to ever come out of Nigeria. He has produced tracks for Dr SID, Wande Coal, D’Prince, Darey, Naeto C, Olakunle Excel et Zanga, Sauce Kid, Ikechukwu & Tiwa Savage. He also collaborated with Jay-Z and Kanye West on the production of Lift Off, featuring Beyoncé on the album Watch The Throne, released on 8 August 2011. Although not acknowledging himself as a recording artist,he is responsible for doing most Background Vocals for Artists he produces for and sometimes does complete verses. His musical dexterity can be heard through his beats and well calculated vocals he assists to the likes of D’Banj, Sauce Kid, Dr SID, Ikechukwu, Kween, D’Prince and even Jay-Z and Kanye West on their Watch The Throne track Lift Off, featuring Beyoncé. The soft-spoken humble producer who is known to grant less interviews, is an avid user of social networking sites with Twitter being his top. With over 200K followers, he is known to give birthday shout-outs to fans, give airtime recharge cards, iPads, and even money via Twitter. Such connection to fans, has earned him a song by some Twitter fan, special for his birthday, sing him praises and wishing him a long-life. His love for exquisite African Fabrics and Male Indian-Gowns isn’t a secret, but he is known to go with his own liking, switching whenever he feels like. At one point in 2011, he was frequently noticed to wear pajamas on daily-basis, in an interview he said, they are more comfortable. I prefer to call them colourful trousers. He is also known to wear sunglasses, carry walking sticks, of which he has several and alternating bling chains, African jewellery and rosary. In 2011 his talents got him noticed by Kanye West who signed him up as a producer on his GOOD Music label. With over a 100 production tracks to his name, the understated genius has worked with a host of local and international celebrities. In spite of his whirlwind superstardom, Don Jazzy has never forgotten his humble beginnings and is very passionate about charitable causes.A video surfaced in the internet on YouTube, showing the signing of the deal,and Kanye West made a surprise appearance at the Koko Concert in London to officially show support and awarded D’Banj with his chain, as a gesture of welcoming him to GOOD Music. However, after 8 years of hard work and struggles to set up the Mo’ Hits label, around March 2012, rumours of irreconcilable differences between the label heads had been circulating,the die-hard fans of the record label and fans of the synergy of Don Jazzy and D’Banj where torn apart,with tweets by Don Jazzy saying Rumours you have all heard recently are sad but true. The way forward now is to make sure I keep bringing you guys more of the beautiful music y’all love to dance to. On the wake of the split up, Samsung unveiled their “Built for Africa” products including an Afro-Pop home theatre which has been developed through the EQ tuning of a sound optimised equaliser – undertaken by leading African celebrity, Don Jazzy. The launch took place in Cape Town, and Don Jazzy had the following to say,“Previously, in 2011, Samsung were focused on the consistent improvement on sound quality and levels – which they were very successful in however, product innovations such as this one will drive the demand and brand loyalty towards their products far more and as long as they continue with this type of product development and drive I am sure they will continue to deliver strong, market relevant products – built specifically with the African consumer in mind,” concludes Don Jazzy. Later in the year,on 7 May Don Jazzy kept his promise of a new beginning, taking to Twitter to announce his new Record Label known as Mavin Records and further promised to release a compilation album of the label artists the very next day. The album which was executive-produced by him, has gathered critical reviews, while blessing the fans with hit songs like Amarachi, Forever, Oma Ga, Take Banana and Chocolate, others are such a C.P.R, YOLO and the labels anthem I’m a MAVIN. The multiple award winning producer also announced that Tiwa Savage would be joining the Mavin family. The signing of Savage, one of Nigeria’s leading vocalists, is seen as a major coup for the budding record label and Don Jazzy promised fans that there are many more exciting faces to be “activated” by the label in the near future. And for the love of social networking, the new label proceeded to make their own social network site known as Mavin League which is a platform for the labels fans to socialise and interact, but also a place for latest news and updates about the label. The label boasts an addition of Tiwa Savage to part of the former members of Mo’ Hits Records who is now the label first lady, with a promise of more addition of “Mavins” in the near-future. On 5 November 2013, he had a cold fight with his former label act wande over stolen of music production from him. While on 7 Nov his record label released official statement of wande coal departure from the label. Tiwa Savage has been the biggest artist on the label since she joined as she keeps releasing hits after hits and most of them produced by label boss Jazzy adding to the fame Don Jazzy and Mavin records already has. In September 2014, Don Jazzy calls on Reekado Banks, Korede Bello & Di’Ja to join the mavin crew in which all were happy to join the crew. This is a clarion call to all Nigerians to wake up. 2014 was a big year for Mavin records after release of multiple hits most especially the single “DOROBUCCI” which was sang by all the acts on the label, the song became the anthem of the year after massive acceptance from fans and music lovers. Don Jazzy have not been seen showing off whom he is dating but he’s been rumored dating a lot of ladies. He has also shown he is a generous man as he gives out often most especially to fans on the social media. The popular man can said to have no popular scandal in particular as we conclude him a noble celebrity.